May 28, 2017. UPDATE: Site Closed. Thanks to irresponsible people, bears have become conditioned to unnatural food sources. 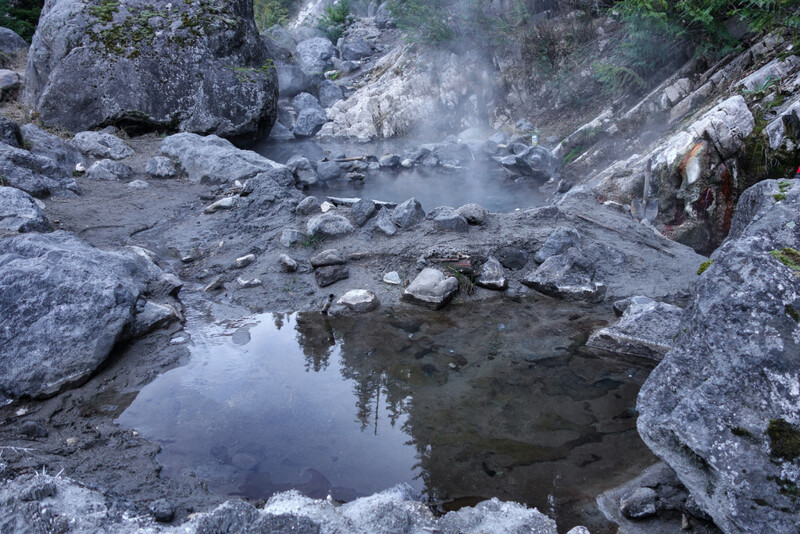 If this closure is ignored by visitors, additional measures up to and including removal of the hot springs bathing tubs may be pursued. 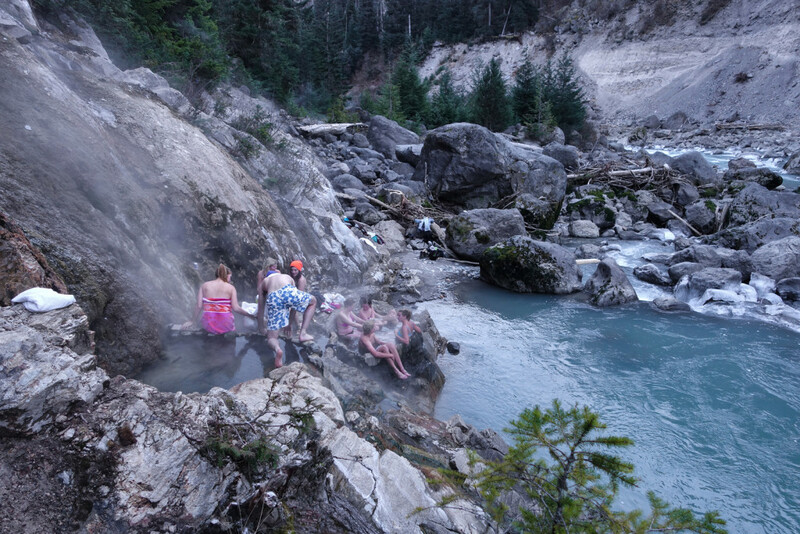 Now that everyone knows about it, welcome to Pebble Creek aka Keyhole aka Keystone (depends on where you’re from) Hot Springs. 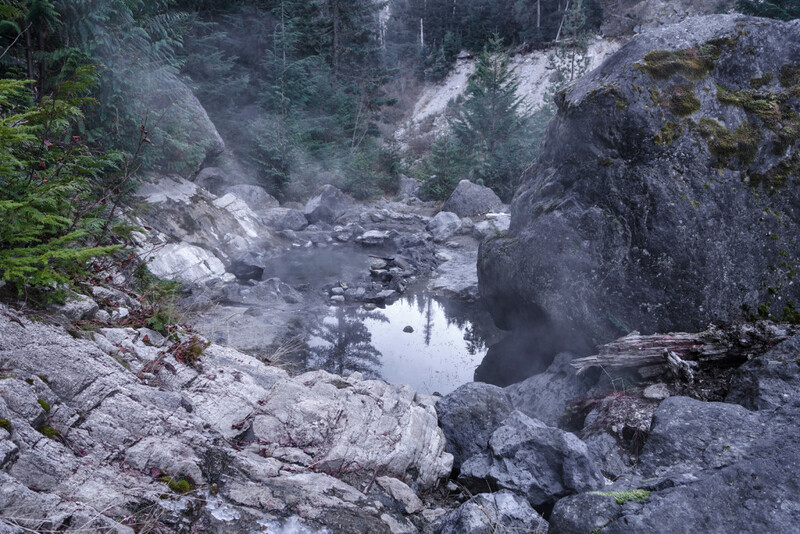 I’ve been curious as to why the springs were given these names; the spectacular Keyhole Falls is located a few kms past the hot springs and Pebble Creek is located approximately 5km south of the springs. I have no idea how Keystone derived, but it’s on a few online references and it’s a generated “check-in” on Instagram – which leads to my reason for posting: compared to my first trip and my most recent trip, the springs have seen an inevitable spike in traffic. As a result, there has been a substantial increase in the amount of garbage. I hope to raise some awareness of this beautiful area and how it is starting to deteriorate. 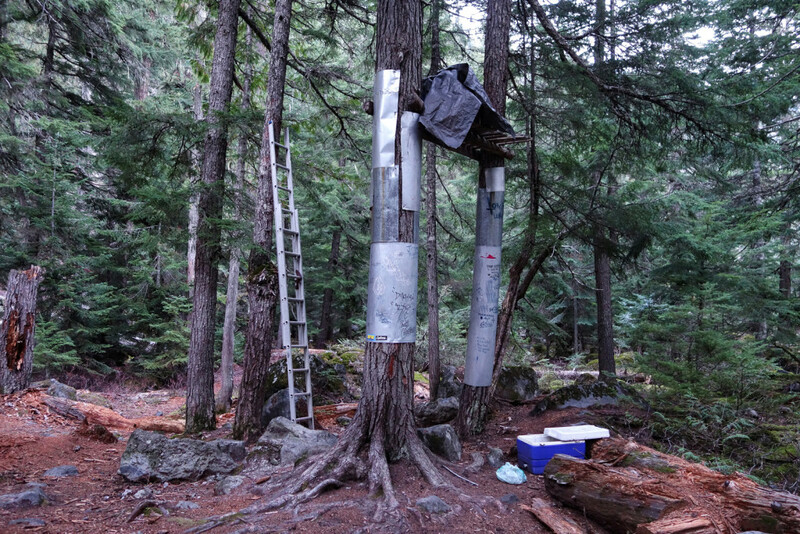 Visitors need to help maintain the trail, campsites, and springs by leaving no trace. In Summer months, the area is infested with flies. 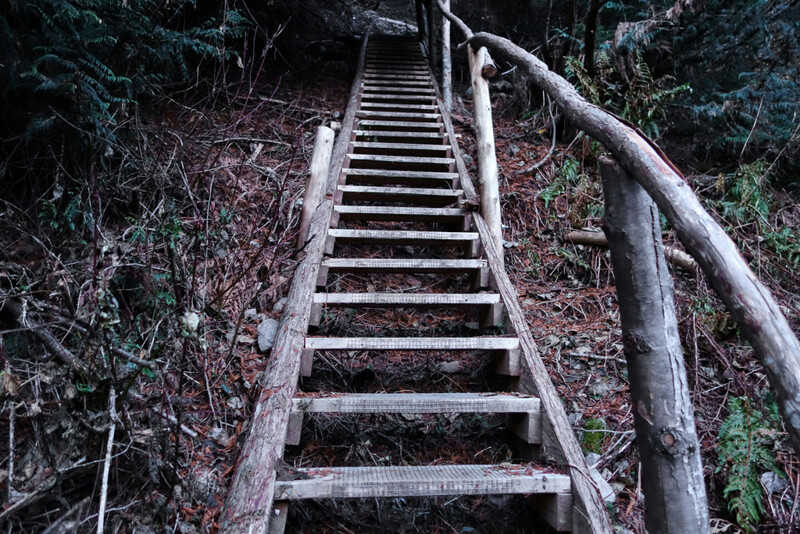 I can recall a few trips where I felt like I was being eaten alive – bring bug spray. 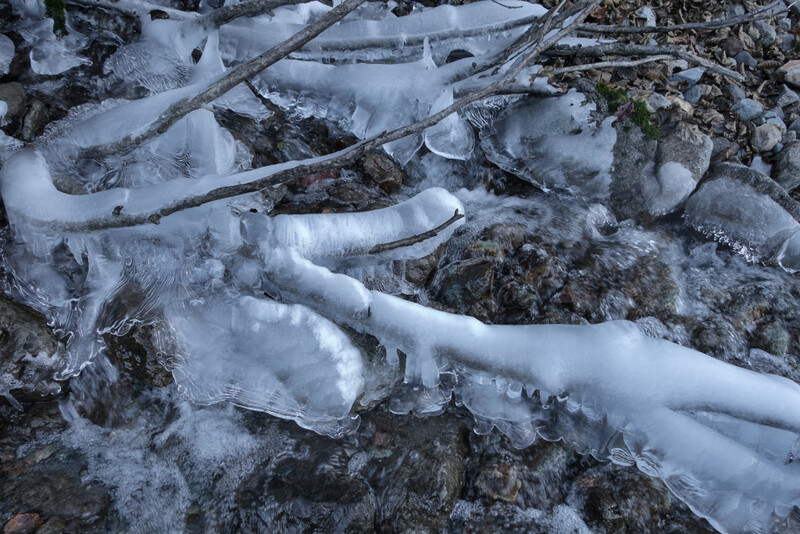 I recommend a good pair of hiking shoes for the trail, but this is not completely necessary as I’ve seen people walk the old trail in flip flops. 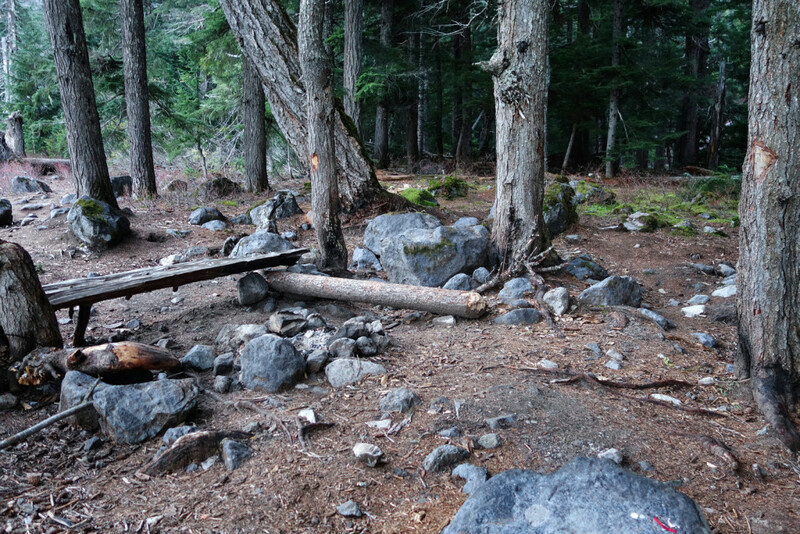 Most of the trail is within trees, but the springs are in an open area. I recommend bringing a lot of sunscreen in the Summer months. 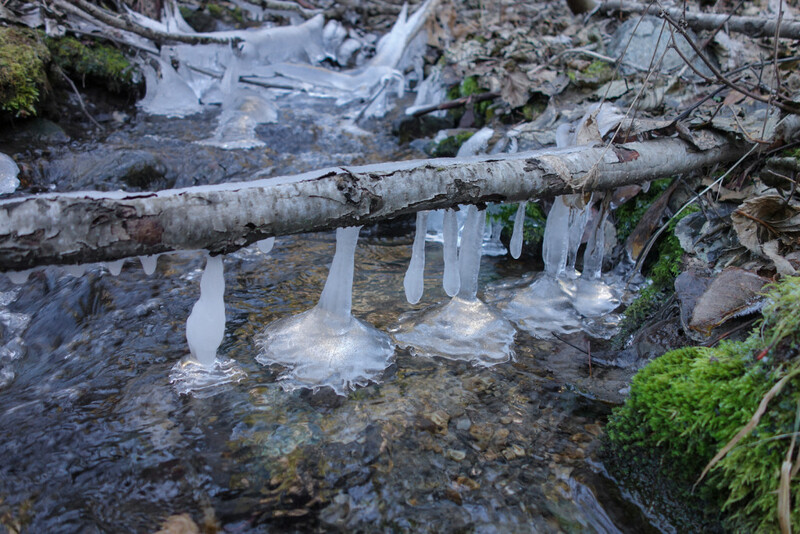 My favourite time of year is in Fall/Winter, especially after the first frost, when the pools are steaming. 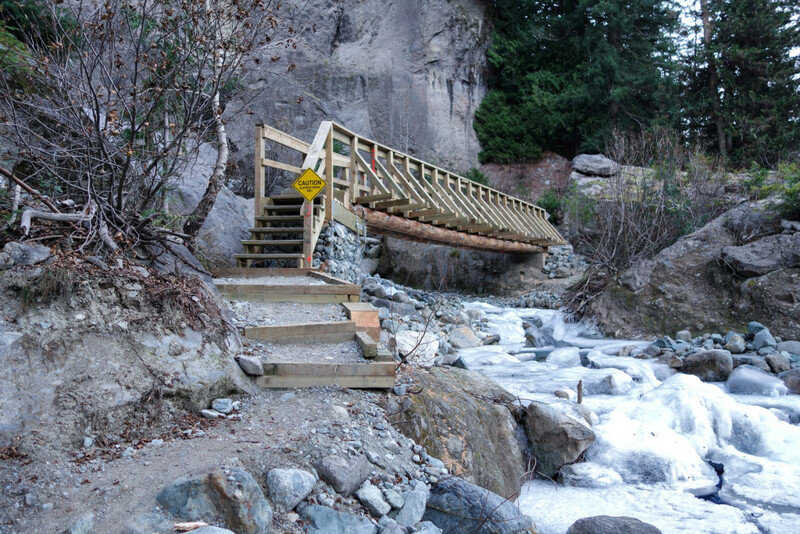 The old trail to Pebble Creek Hot Springs has been closed to public access due to the Upper Lillooet River Project. 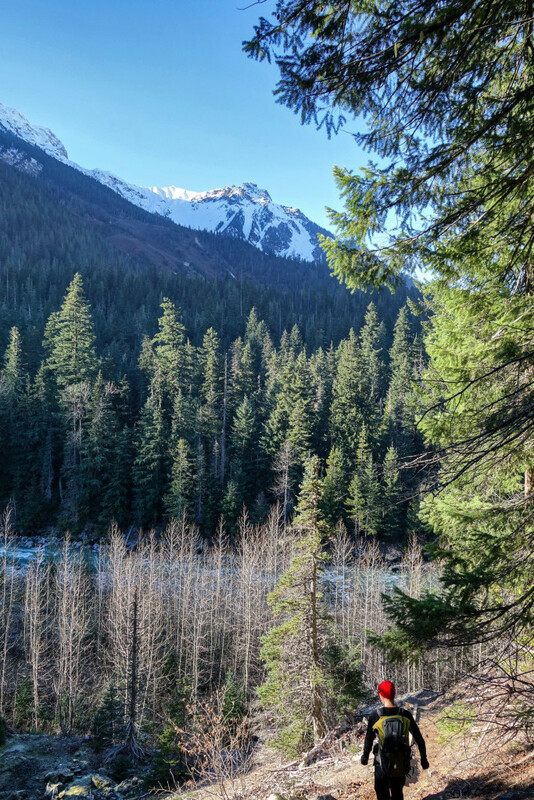 The trail immediately entered the forest and we were surrounded by vast, beautiful cedar trees. As the sign states, there was a kiosk about 100ft ahead with a map marked with the trail and view points. The kiosk was in the middle of “Cedar Grove”, which contained a number of relatively large cedar trees and a short interpretative trail. The new trail doesn’t actually go all the way to the springs. Rather, it ends at what used to be the “overflow” campsite area for the springs. 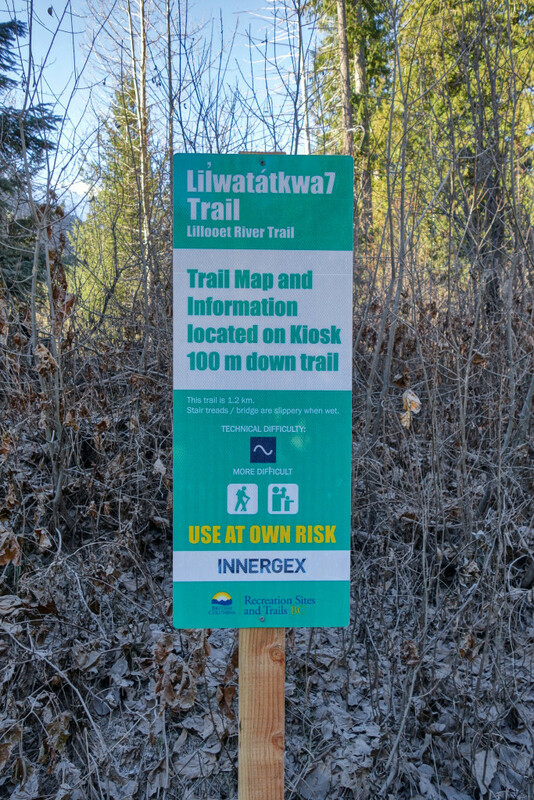 The Lilwatakwa7 Trail itself is 1.2km in distance and has a few steep sections. 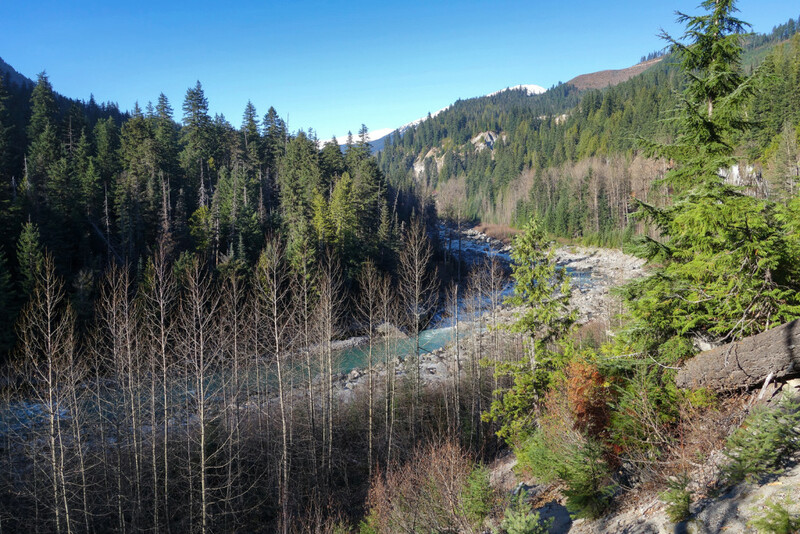 It follows the river with a few viewpoints, improved stairs/steep switchbacks, and the occasional bench to rest on. It is well marked and easy to follow. 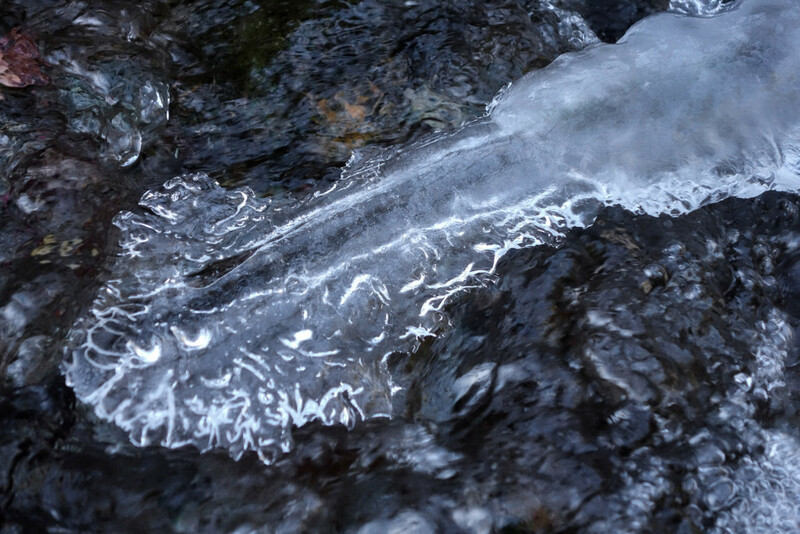 From your car to the hot springs, travel time can take as little as 30 minutes, but if you’re a geology buff, you’ll spend more time scoping volcanic features in the area and checking out the little waterfalls. 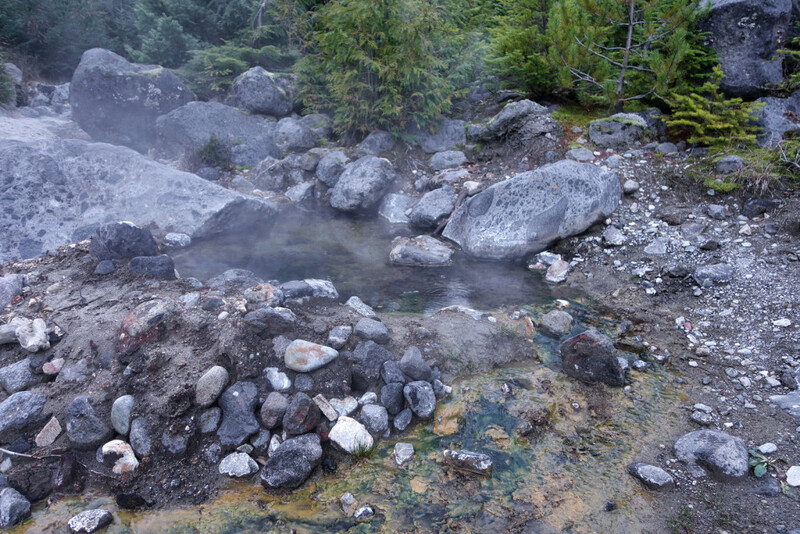 Keep in mind, Pebble Creek Hot Springs is the result of current volcanic activity, and the Meager Group produced the largest volcanic eruption in Canada in the last 10,000 years. From the kiosk, the trail meandered through the forest. 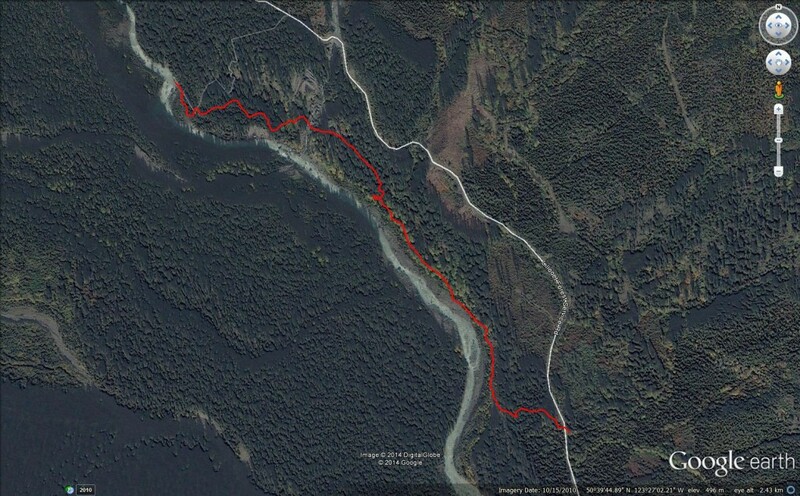 Within a couple hundred feet, we crossed a road for the power project and picked up the trail on the far side. 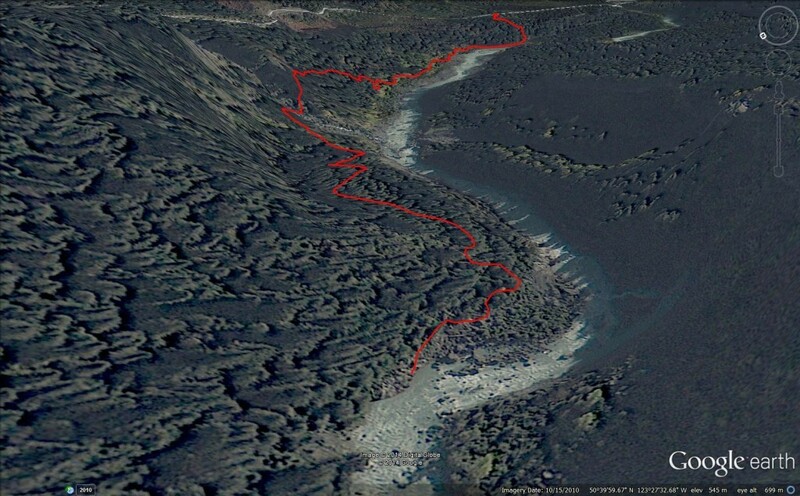 After a short section through the forest, the trial dropped somewhat steeply towards the river. 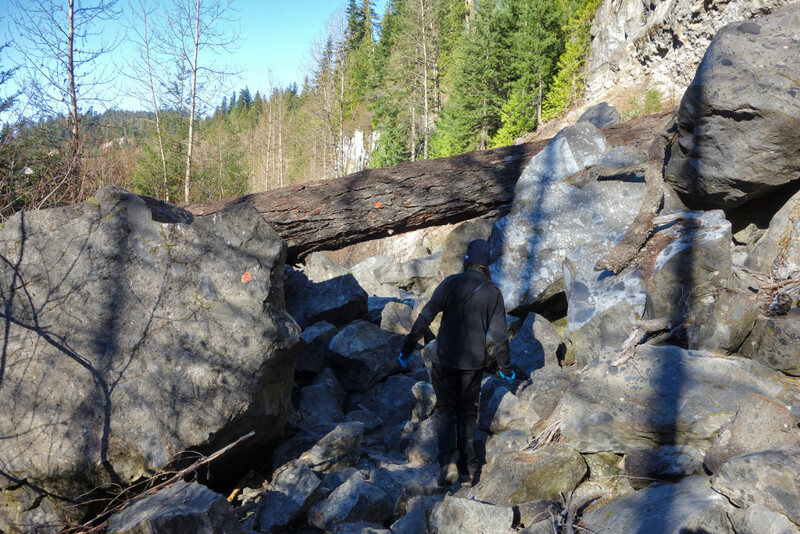 The trail continued upstream and reached a boulder field. 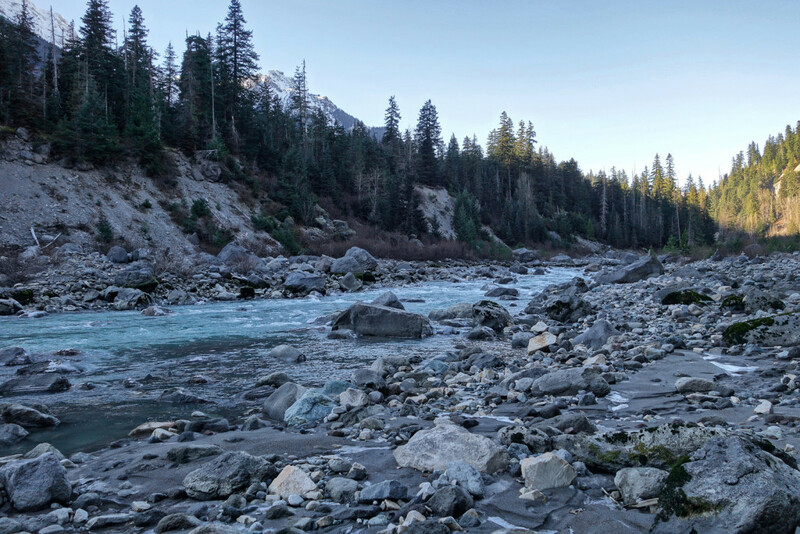 Once we crossed the boulder field, the trail was relatively flat and brought us out to Lillooet River. 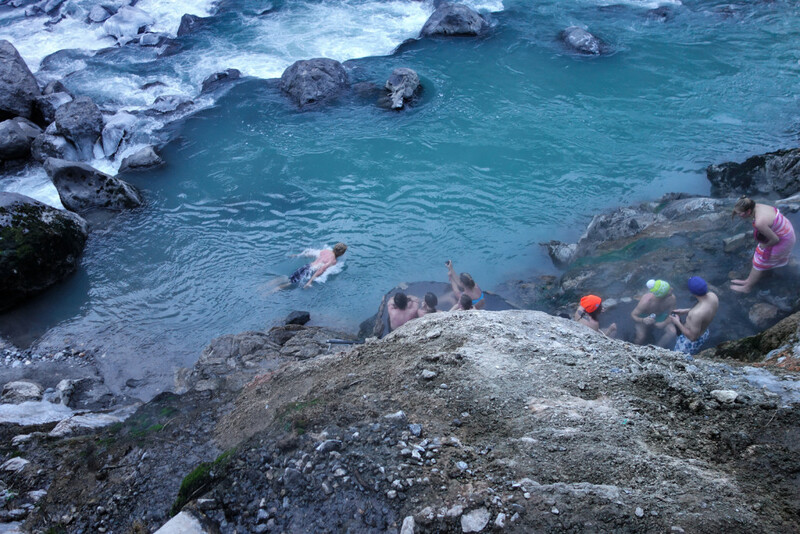 Within 5 minutes, we arrived at the first few pools of Pebble Creek Hot Springs. There are about 8 pools in total; we noticed 2 newer pools and it looked like someone had cleaned out a few of the existing pools. The pools are small, so be prepared to get comfy with your neighbours. 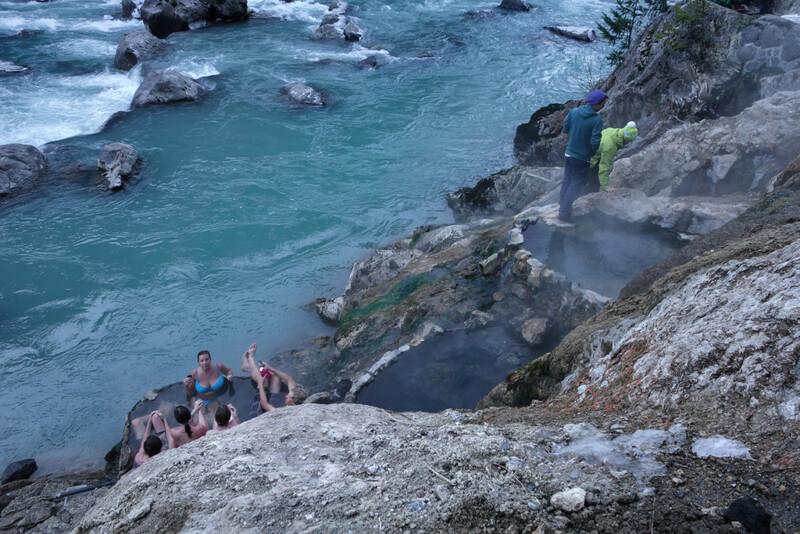 Note that some consider the springs to be “clothing optional” – govern yourself accordingly. It was a sad to see the amount of beer cans and trash at the main springs. 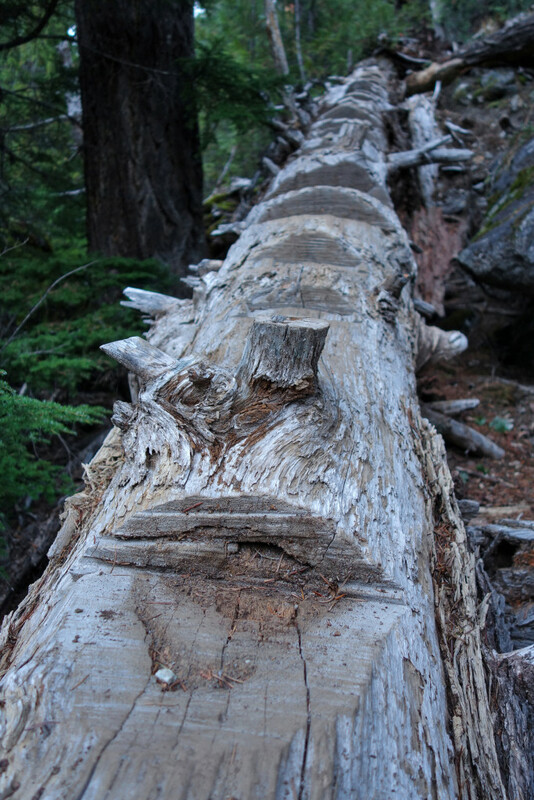 Along the trail, people had left scattered articles of clothing, an old towel, and empty cans. There were approximately 10 people at the springs and we ran into another 10 coming in when we were on our way back to the truck. On our first few trips to the springs, we were lucky to run into few people. 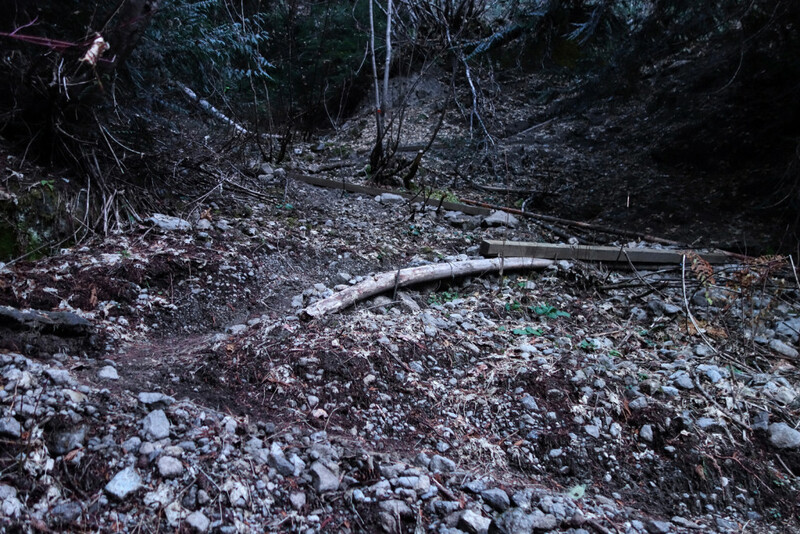 A spike in traffic was inevitable due to the new trail work and the springs becoming better known to the general public. The traffic is manageable as we found empty pools on a busy day, but the amount of garbage left behind was very disappointing. For future trips, I’ll make a point of taking empty bags to help clear out some of the mess. I’m hoping people will practice good outdoors ethics and help conserve the area so everyone can enjoy the springs for as long as possible. I’m going this weekend and will make sure to bring an empty bag to pick up garbage. Great idea, thanks! Awesome Daniel, very glad to hear and thanks in advance. Hope you have fun this weekend. Looks like a gem of a spot! Too bad that some of the people who decide to go there don’t care to care for it!!!! Agreed! I haven’t been back there in a while but when I go, I’ll take some garbage bags to help clean up. How are the Upper Lillooet Forest Service Road and trail current condition? We are planning to go there on this weekend. 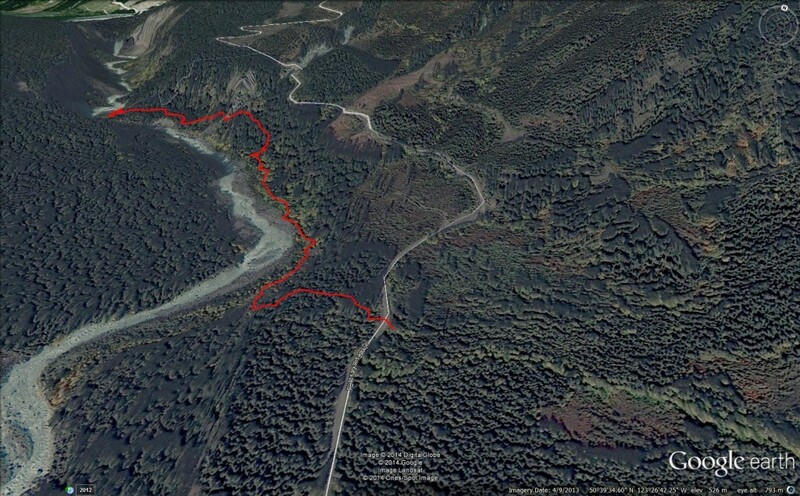 PUBLIC SAFETY NOTICE-The Pebble Creek Hotsprings Trail, also known as the Keyhole Falls Hotsprings Trail, located at 42 km on the Upper Lillooet Forest Service Road, has been CLOSED indefinitely due to the presence of numerous food conditioned black bears and grizzly bears in the area. 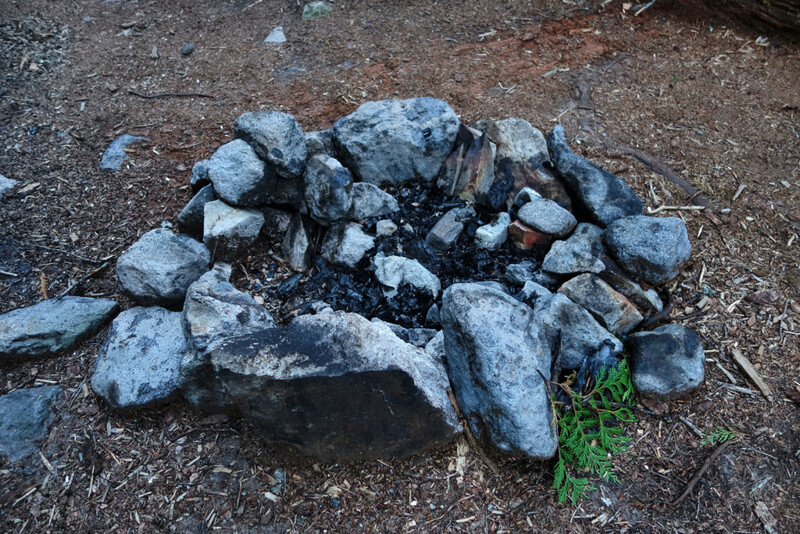 Remember a fed bear is a dead bear, campers must secure their food and garbage so that wildlife cannot access it. 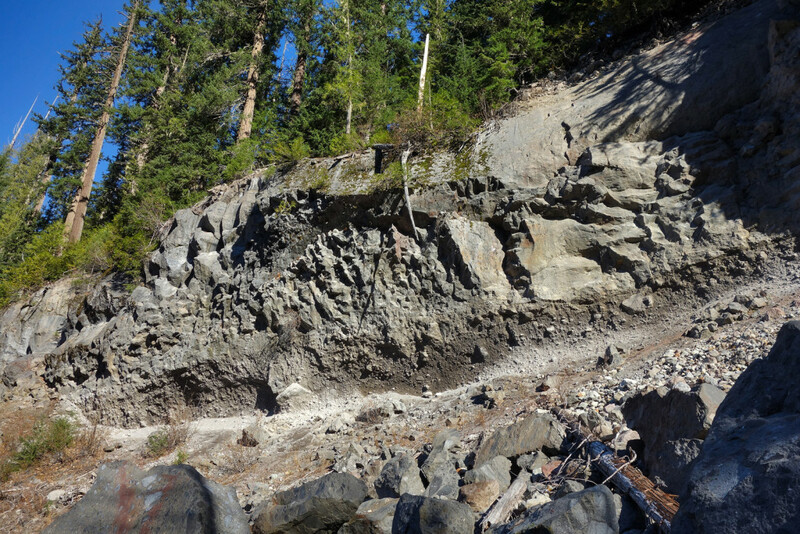 PUBLIC SAFETY NOTICE: Pebble Creek/Keyhole Falls Hotsprings remains closed due to the presence of numerous food conditioned and aggressive bears. There has been a confirmed report that a sow black bear with four cubs has charged 2 people. This is a very dangerous situation and the bears in the area are acting aggressively. There is a high probability that continued use of the area will result in an attack. The public must respect this closure or we may be forced to destroy this bear.